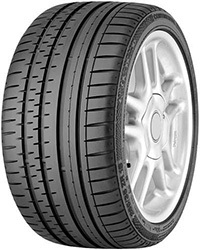 The Continental Sport Contact 2 came to the market before the Sport contact 3 but still has many excellent features making it a premium high performing tyre that has precise steering and handling.The Sport Contact 2 performs well in the wet and dry and comes as the original tyres for many car manufacturers such as the Audi A4, Saab 9.3 and 9.5 and the ford Focus and Galaxy.The Sport Contact 2 is also available as a run flat tyre and is also suitable for other vehicles. The Continental Sport Contact 2 has many excellent features making it a premium high performing tyre that has precise steering and handling. The Sport Contact 2 performs well in the wet and dry and comes as the original tyres for many car manufacturers such as the Audi A4, Saab 9.3 and 9.5 and the ford Focus and Galaxy.The Sport Contact 2 is also available as a run flat tyre and is also suitable for other vehicles.